This entry was posted in Academic achievements, Students and tagged College of Human Sciences, Honors College, hunger, world food programme on February 6, 2014 by Wire Eagle. 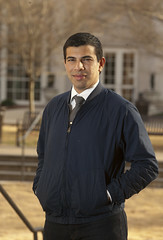 AUBURN UNIVERSITY – Auburn University senior Azeem Ahmed has been named winner of the 2014 President William Jefferson Clinton Hunger Leadership Award, an honor presented to only one university student worldwide each year. This entry was posted in Community, Events and tagged beat bama food drive, hunger on October 8, 2010 by Wire Eagle. AUBURN – The Committee of 19, Auburn University’s leadership team for the War on Hunger, has designated Oct. 11-16 as Hunger Awareness Week at Auburn University. This annual weeklong event highlights the plight of the one billion chronically hungry people throughout the developing world and draws attention to the needs of individuals and families in the local community through events sponsored by various colleges and schools at Auburn. For the complete schedule of Hunger Week activities, go to www.auburn.edu/hunger.